From the middle of the misty domed web, a spider the size of a small elephant emerged, very slowly. There was grey in the black of his body and legs, and each of the eyes on his ugly, pincered head was milky white. He was blind. ‘What is it?’ he said, clicking his pincers rapidly. A second later, the bird was flying straight at Harry. It dropped the ragged thing it was carrying at his feet, then landed heavily on his shoulder. 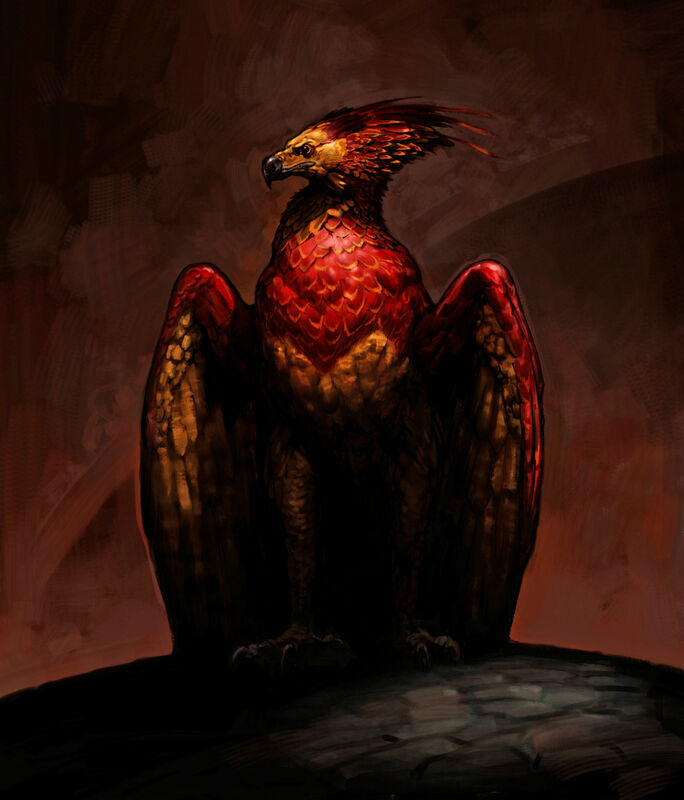 As it folded its great wings, Harry looked up and saw it had a long, sharp golden beak and beady black eyes. For a moment, he was sure he’d walked into a nightmare – this was too much, on top of everything that had happened so far. They weren’t in a room, as he had supposed. They were in a corridor. The forbidden corridor on the third floor. And now they knew why it was forbidden. They were looking straight into the eyes of a monstrous dog, a dog which filled the whole space between ceiling and floor. It had three heads. 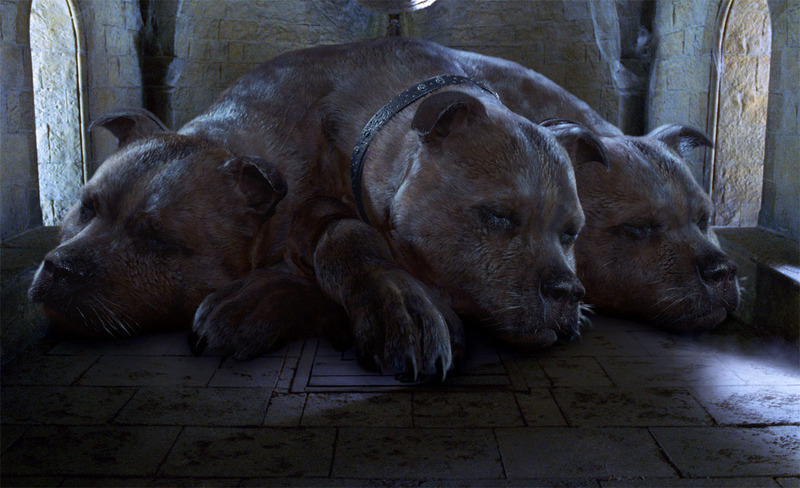 Three pairs of rolling, mad eyes; three noses, twitching and quivering in their direction; three drooling mouths, saliva hanging in slippery ropes from yellowish fangs. Robert Bliss’s final Basilisk design. 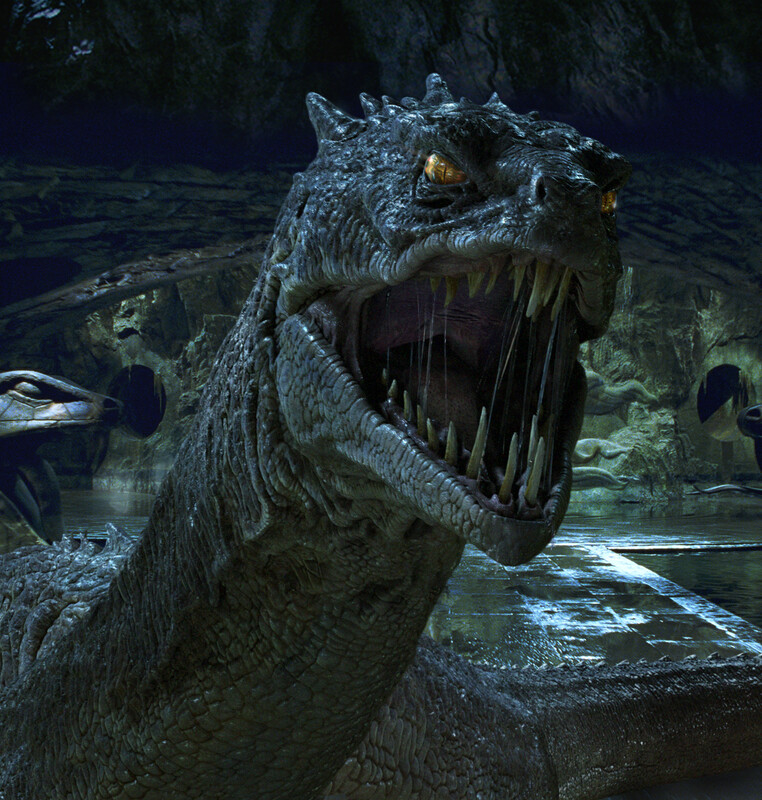 The Basilisk in the film version was established as being 80 feet in length. Robert Bliss designed the beast, with real-life reference provided by an eight-foot long Burmese Python named Doris. 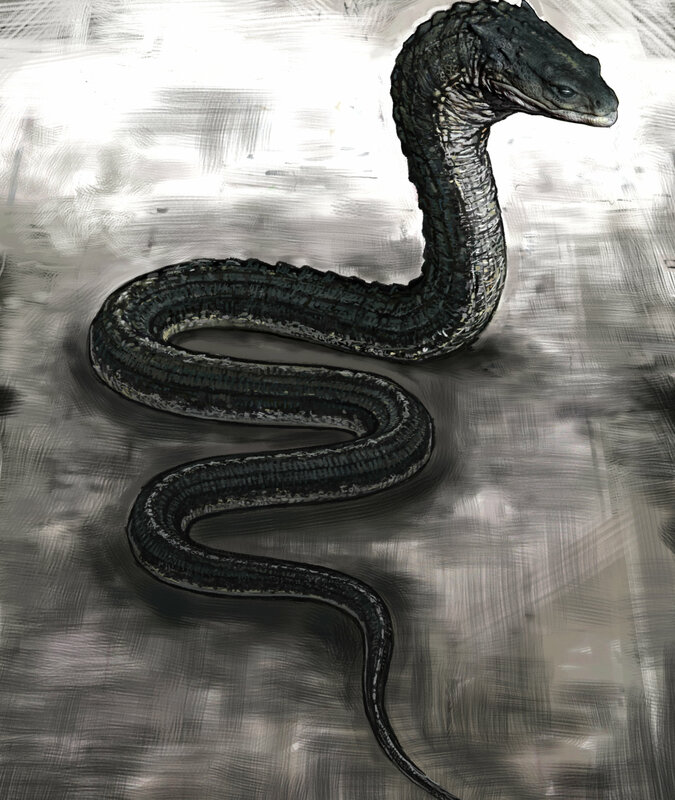 Initial iterations maintained a relatively simple snake-like appearance, but the concepts progressively began implementing subtle characteristics of other reptiles — such as monitor lizards and crocodiles — resulting in the Basilisk taking on a more dragon-like appearance. The textures were based on snakes, but made “a little more exaggerated than say, a normal snake’s,” according to Chris Fitzgerald, part of the sculpting crew. 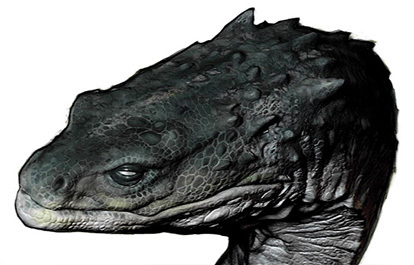 The Basilisk’s skin was endowed with osteoderms and other hard scales, and unlike real snakes, the creature was given eyes with functional eyelids. A small-scale maquette was sculpted by Robert Bliss and Chris Fitzgerald to be scanned digitally. 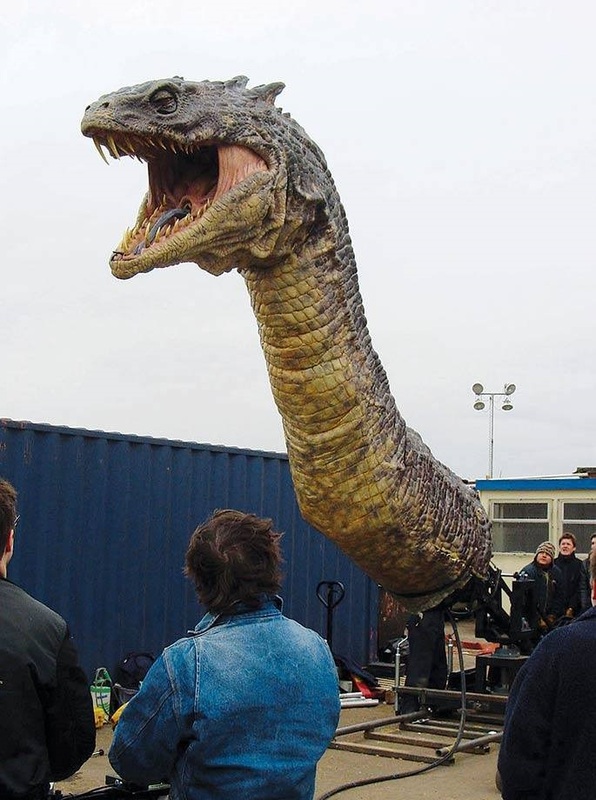 The original intention of the filmmakers was to bring the Basilisk to the screen as a fully digital creation; only the shed skin of the Basilisk was to be built practically. 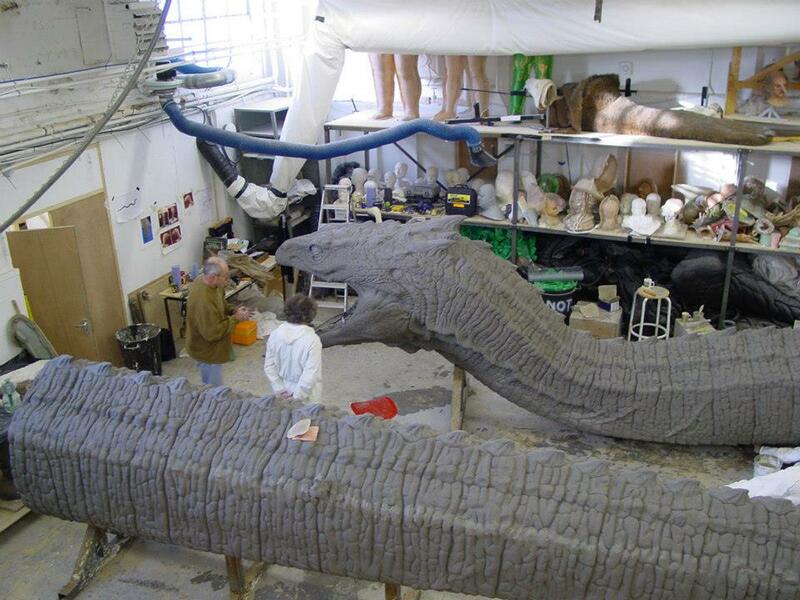 Given that a full sculpture was needed to eventually mould the shed skin out of it, Dudman suggested to build a practical insert puppet of the Basilisk. The choice was advantageous on two fronts — not only would it lessen the amount of needed digital effects sequences (thus save budget), but it would also provide the young Daniel Radcliffe with a physical Monster to react to. John Coppinger and Graham High sculpting the Basilisk. 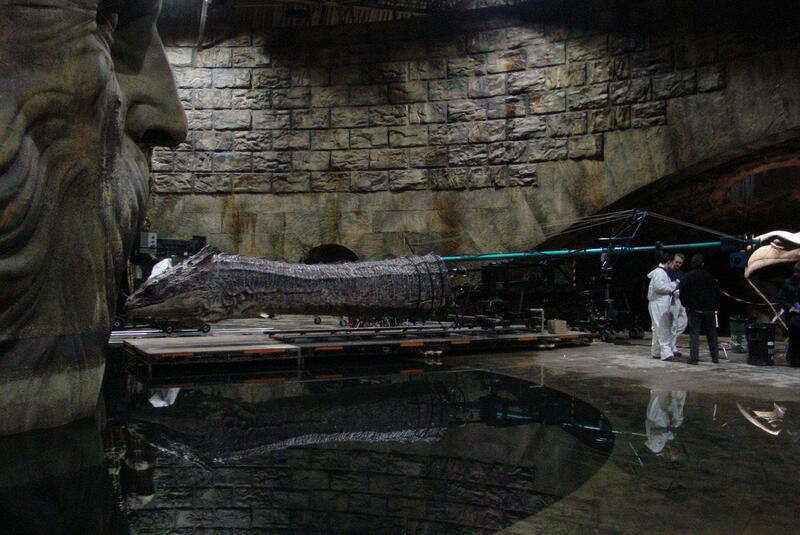 The main Basilisk puppet was an animatronic, mechanized by Phil Ashton and Malcolm Evans. 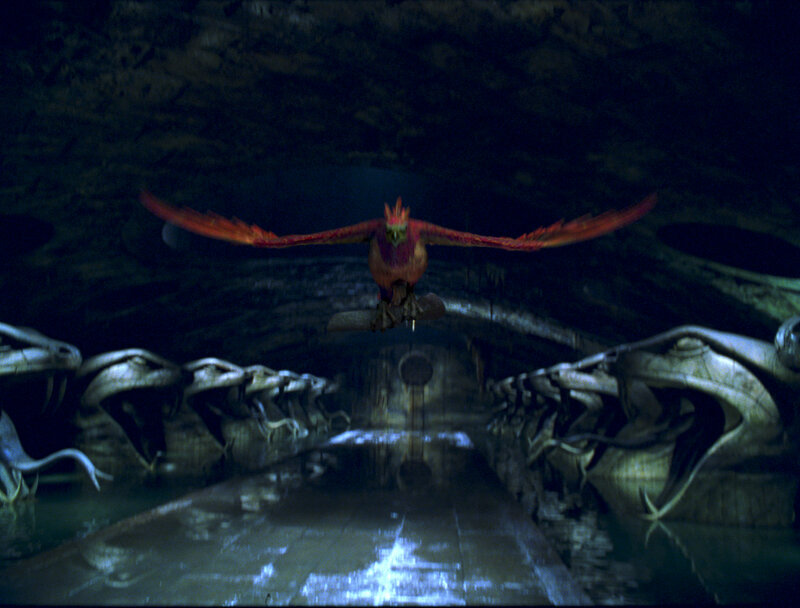 Its eyes were already gouged out, as the shots of the Basilisk before Fawkes’s attack were all planned to be digital. This also saved the crew the effort of having to develop functional eye and eyelid mechanisms. 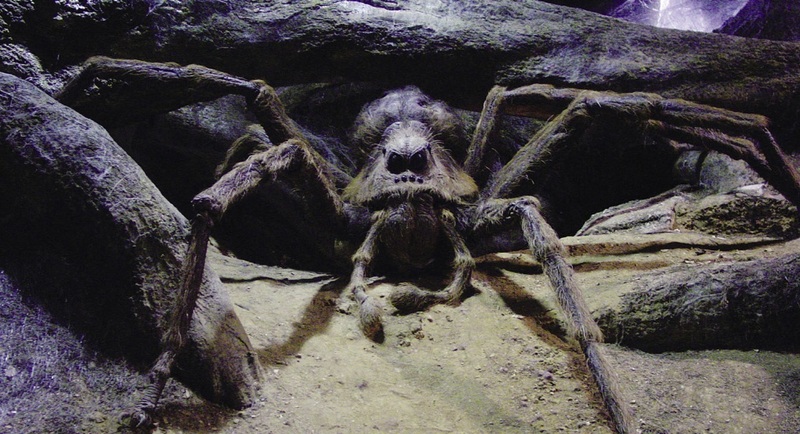 The puppet, like Aragog, employed aquatronics instead of traditional hydraulics — allowing for smoother gross movements. 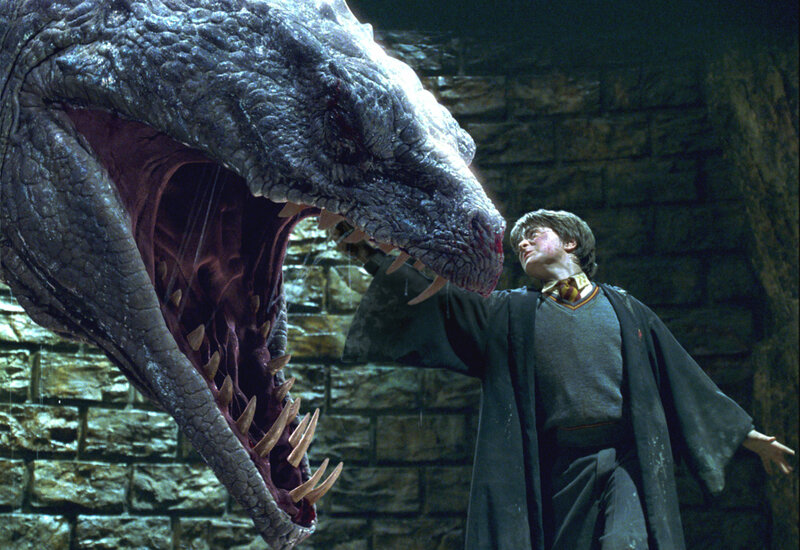 The Basilisk animatronic had a fluid range of head and neck movement. The head was fully operational, with a jaw-opening mechanism, as well as moving eyelids, nostrils, and tongue. The fangs of the creature were cable-controlled and could retract as its mouth closed and move forward as it opened — a trait inspired by real snakes. 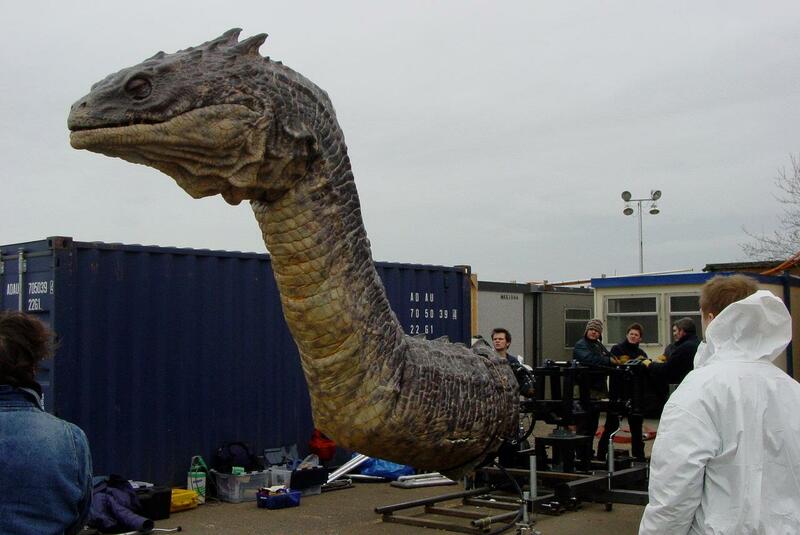 The internal structure of the puppet was custom-devised with aluminium ladders: “when we looked at the design of the snake,” Dudman told Cinefex, “we knew we needed to build sort of a geodesic structure for its body. When I looked at the drawing for that structure on the computer, I said, ‘it looks like step ladders to me.’ I knew it would save us a huge amount of machining if we just used step ladders for the bulk of the structure, so that’s what we did.” This step-ladder framework housed the internal mechanisms and was thus reinforced to sustain more weight. 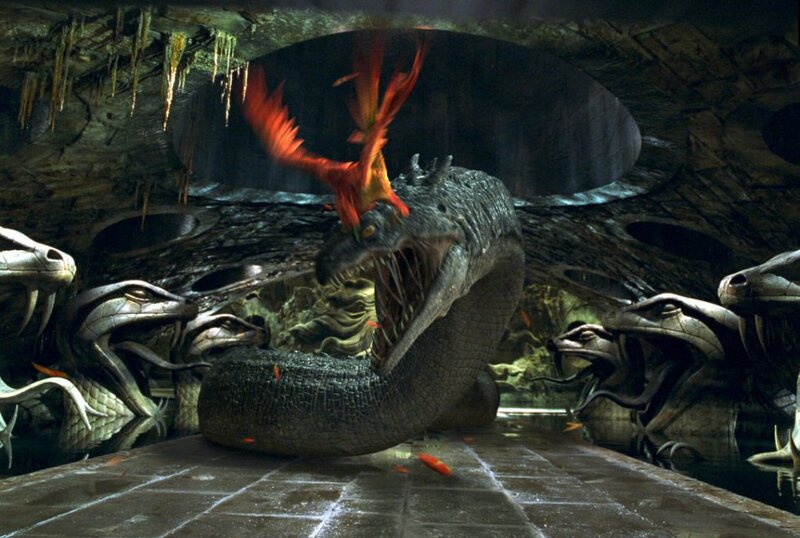 It was covered with a tubular armature — also built in aluminium to ensure both light weight and endurance — over which the Basilisk’s skin was laid. The foam latex skin was painted by Astrig Akseralian (the lead painter, and painting supervisor of the Basilisk models), Elaine Cartwright Best, and Mel Lenihan. 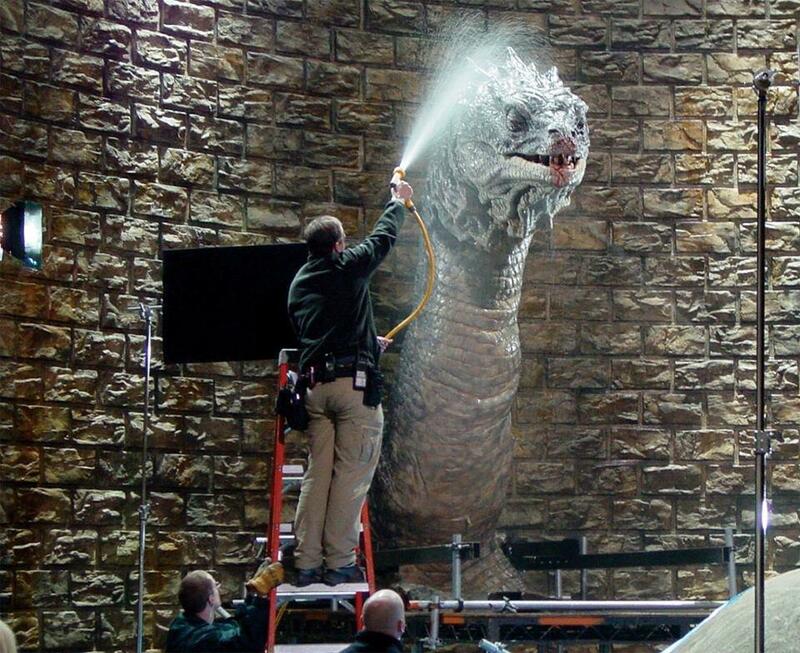 The practical Basilisk was intercut with a fully digital version of the monster, featured in the majority of the effects scenes. 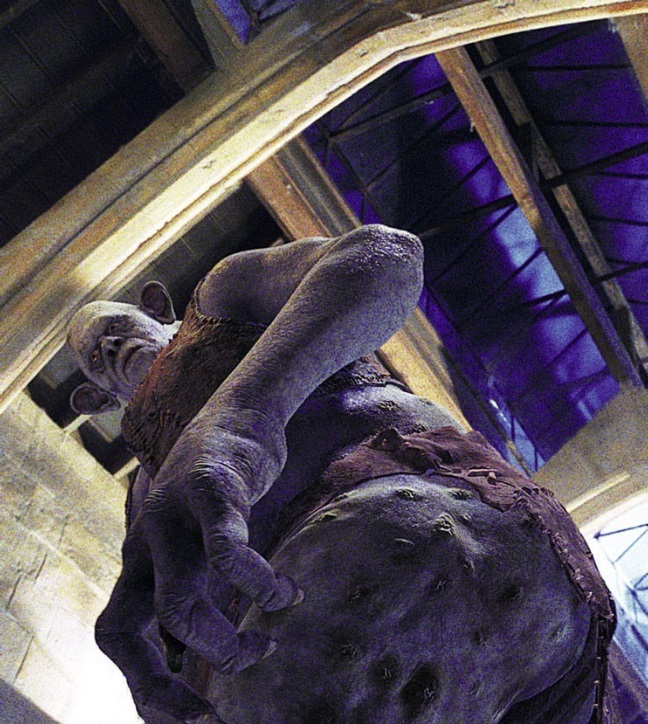 The total of 45 visual effects sequences were devised by Framestore. 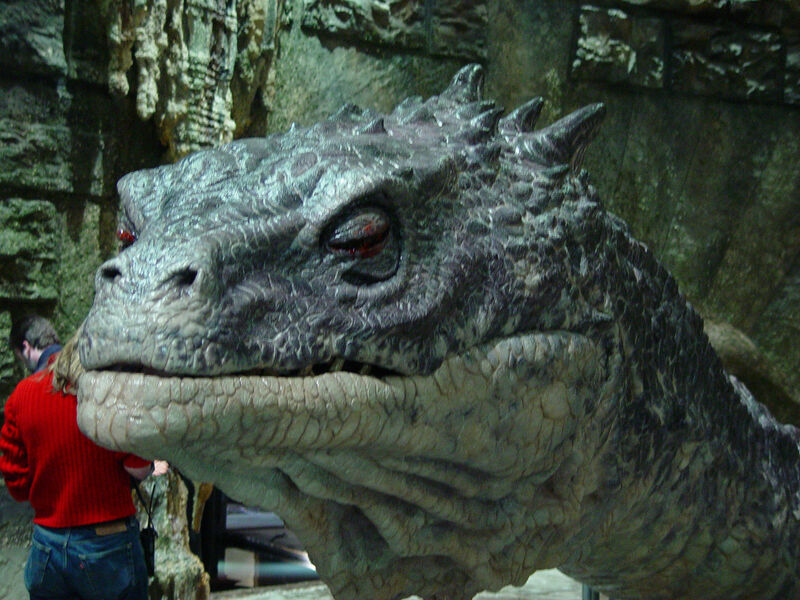 The digital model of the Basilisk was first obtained from a digital scan of the small-scale Basilisk maquette, which was then refined manually to match the appearance of the animatronic. For rendering and animation, the digital effects artists used Maya, Houdini and Renderman. The textures were painted by Jason Horley in Photoshop. Character rigger Felix Balbas devised a set-up that allowed the animators to switch from inverse kinematics to spline weighting or forward kinematics, depending on the requirements of a specific animation sequence. Eames continues: “for example, when the snake is chasing Harry, its head is down low and its body is working along a path: then as it comes up to Harry, its head is up and its body starts to slow down. Obviously, some of the body is still rigidly in contact with the ground. 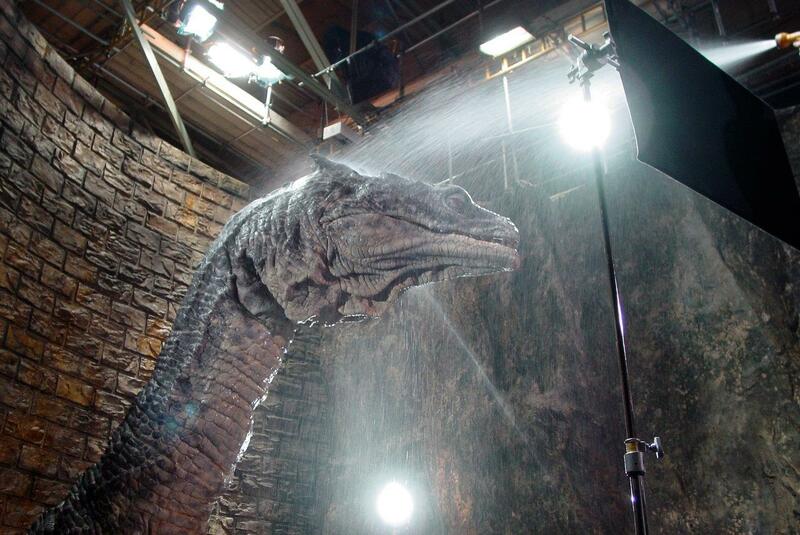 So we had a range of controls that faded off their range of ingluence from the neck into the body to control body parts independently.” Crucial to the animation was also the Basilisk’s interaction with water, which was achieved with digital water elements (including flow maps for the water that dripped off the creature’s skin) as well as practical water elements composited into the shots. 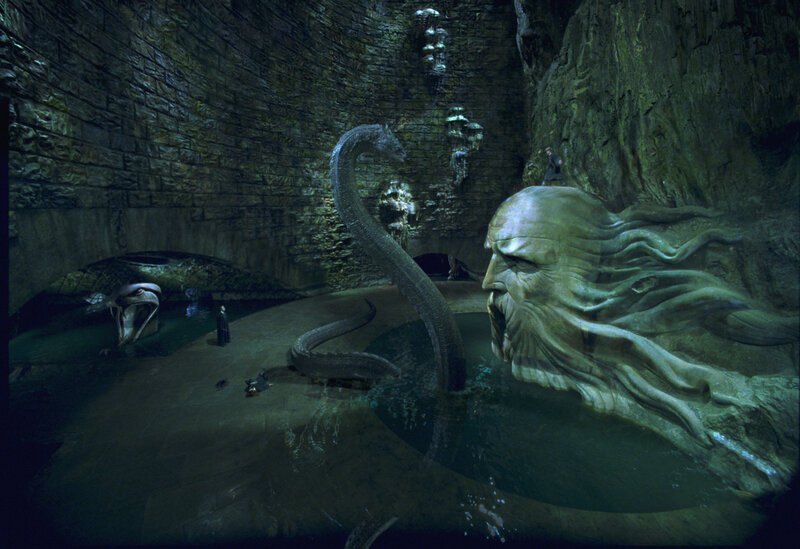 The Basilisk’s skeleton makes a cameo in Harry Potter and the Deathly Hallows: Part II for which the Chamber of Secrets set was recreated using both digital and practical elements. 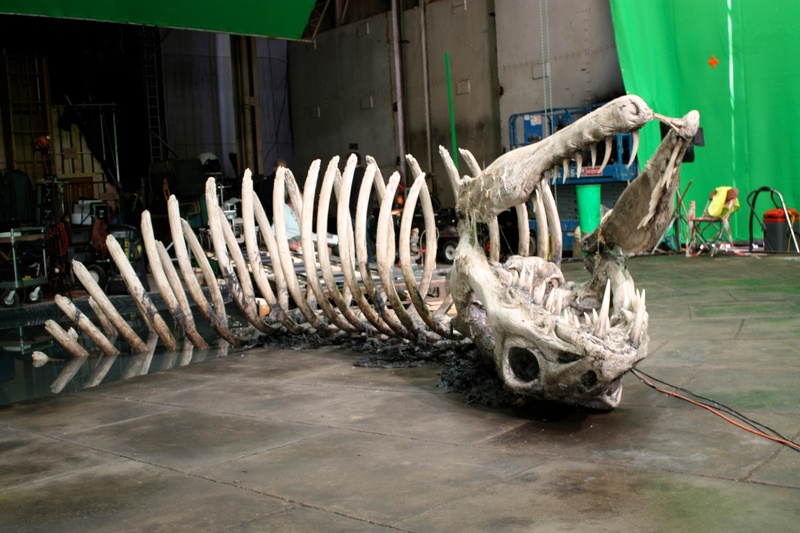 The corpse was an eight-foot long full-size model of the Basilisk’s skull and neck vertebrae, sculpted by a team of sculptors led by Shaune Harrison and then moulded in fiberglass.